Exploring the Northern Tradition is an overview of the modern reconstruction of the ancient religion of the Germanic and Scandinavian peoples. This religion, called Heathenry, is one of the fastest growing polytheistic religious movements in the United States today with over forty thousand adherents. This book provides a thorough guide to the cosmology, values, ethics, and rituals practiced by modern Heathens. Readers will have the opportunity to explore the sacred stories of the various Heathen Gods like Odin, Frigga, Freya, and Thor and will be granted a look into the devotional practices of modern votaries. The most common devotional rite: the faining or blót is examined in rich detail with examples given for personal use. Additionally, readers are introduced to the concept of wyrd or fate, so integral to the Heathen worldview. 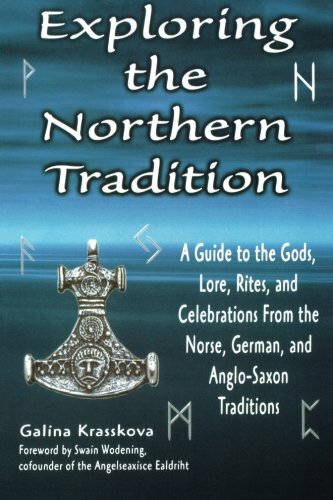 Unlike many books on Heathenry, Exploring the Northern Tradition is not denomination specific, nor does it seek to overwhelm the reader with unfamiliar Anglo-Saxon or Norse terminology. For those new to Heathenry, Pagans who wish to learn more about the Norse Deities, or those simply interested in learning about this unique religion, this book is the perfect introduction.